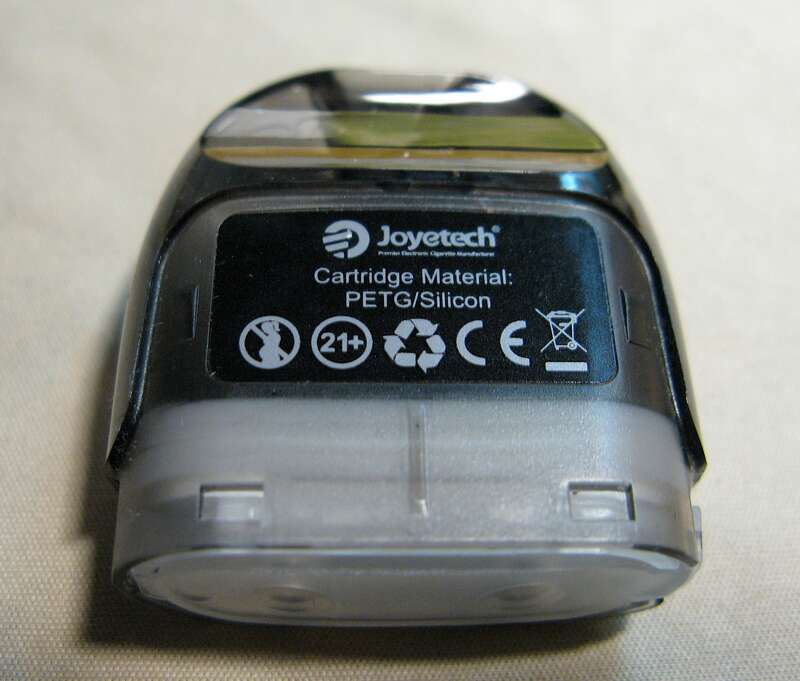 Joyetech provided me with the device, but I always give a realistic review, usually after a week or two of daily use. I normally use an identical well known premium e-liquid for all my reviews, it’s high VG, zero Nic and uses fruit flavourings with complex flavour notes, I know how it tastes in many devices and with varied settings, in that way I can judge how good a device is at releasing subtle flavours. NB- Excuse the dust on some images, I loathe dusting! 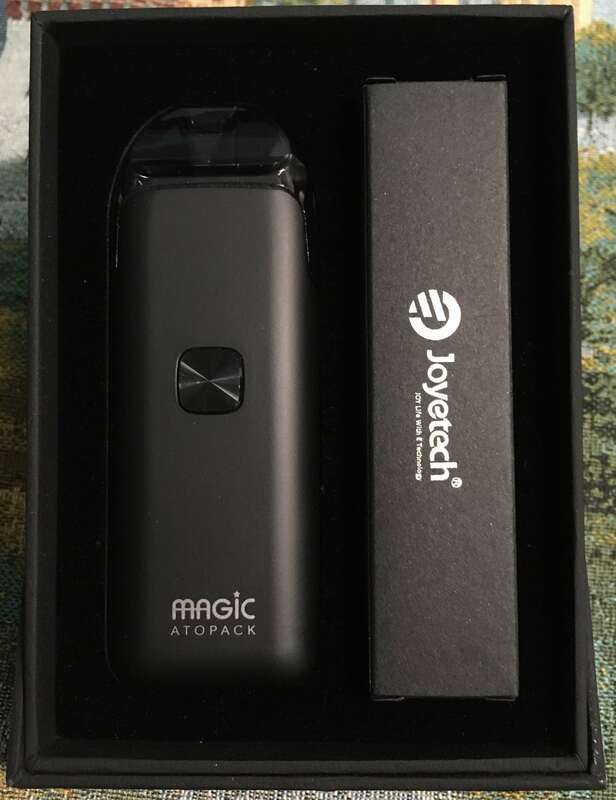 The Magic Atopack is an innovative system pod as you can rewick it, there is no coil inside the pod, instead it uses a variant of the Joyetech NCFilm Heater first used in the Cubis Max tank, it’s smaller but similarly powerful and user friendly. As usual i won’t delve into the technicalities too much but provide a real user review, I have been using the Atopack for weeks now. 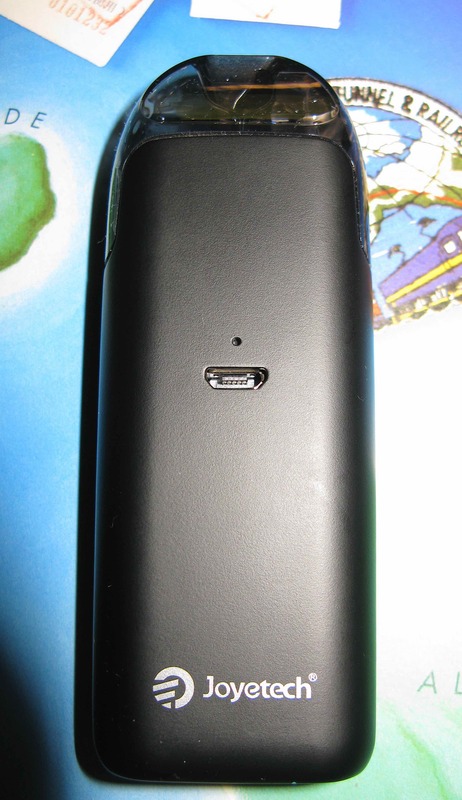 The neat black packaging reveals a range of quality accessories; the Atopack itself with it’s 1300 mAh internal battery and attached pod, a USB cable that is an improvement on many others in that it uses flat strong cable and metal connectors, a pair of quality tweezers and a pack of 50 organic cotton squares and the instruction leaflet. The Atopack battery unit is built from a metal alloy and is hefty and tough, it’s available in Black, Phantom Blue and Silver. It’s very simple to operate, the standard 5 clicks of the well fitted and positive actioned fire button for on and off, there’s a 7 colour LED that is selectable by pressing the fire button 3 times so the LED flashes 3 times and then toggle between red, yellow, gree, blue, indigo, white, purple and off. 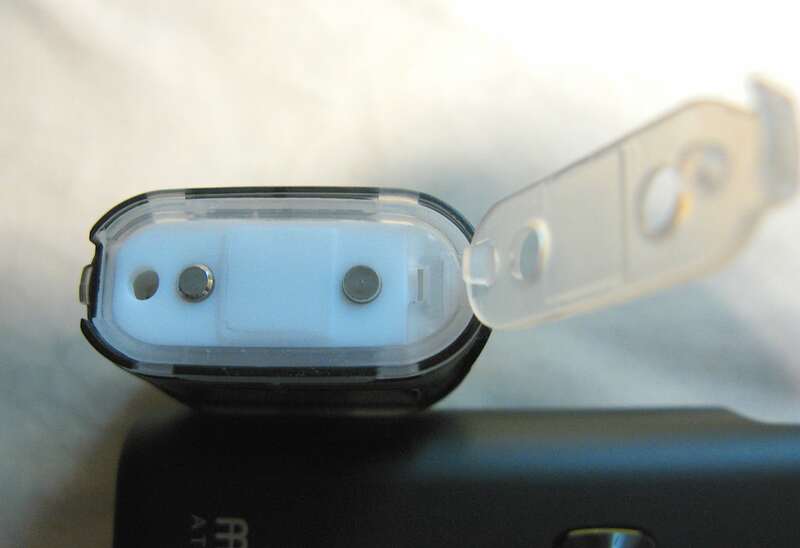 The LED also indicates battery life: Solid LED = 60-100% capacity, slow flashes = 30-59%, moderate speed flashes = 10-29% and finally rapid flashes = 0-9% where the Atopack will not fire. These are a reasonably accurate guide, I was able to use it all day without any difficulty. Filling up is easy, remove the push fit pod and flip open the large hinged door after releasing the locking clip. I received a 7ml capacity pod which lasted well, in the EU the capacity is theoretically smaller at 2ml (if you are unlucky! 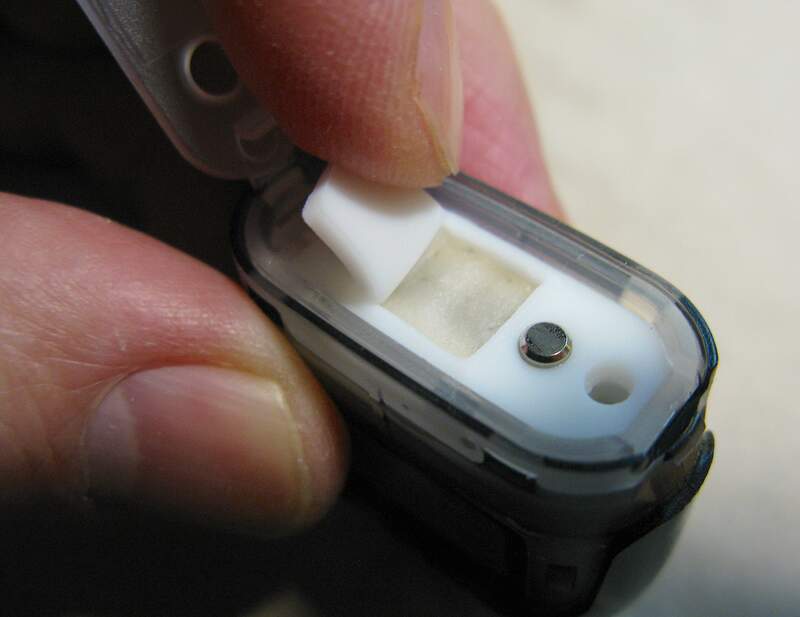 ), you will then see the small filler hole, this requires a thin tip on your liquid bottle. simply squirt in carefully without overfilling, close the door again and there you are. Replace the pad with the new one using the tweezers and prime it with a couple of drops of liquid, close that tiny door, close the main door and latch it and it’s done. If the heater itself is a bit mucky you can clean it gently with a lint free cloth first. In my image above the pad has had almost two fills through it and is showing a little colour, ymmv ofc. The NCFilm heater itself is quoted as lasting around three months. To use, turn it on, hit the fire button and vape. It’s a fairly open draw and as a DTL vaper I found that perfectly possible, if you are MTL you may find it a little loose. The flavour intensity is good, not as good as with a full size tank or the larger NCFilm heater in the Cubis Max but it’s good as is the vapour volume. The liquid I use is 70% VG but I have experienced a little gurgling at times after the Atopack had been sat unused overnight, but it soon cleared in use, if you use a thinner higher PG liquid you may experience this more often therefore. I have also experienced some weeping of liquid from the base of the pod out through the main door, not enough to describe it as a leak but it was there. Easily mopped up though. If you look closely at the above image you can see some trace of liquid on the battery contact, that did not affect operation for me. 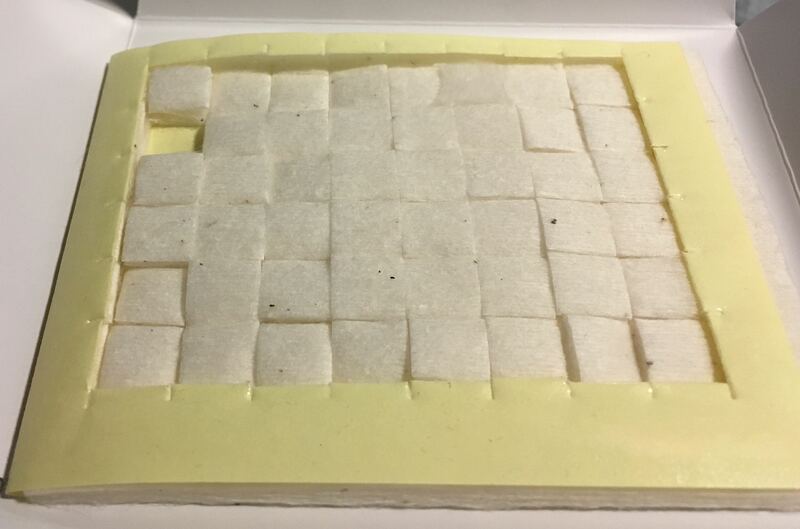 As no other reviewer has reported this weeping I hazard a guess that the newer cotton pads resolve this issue. 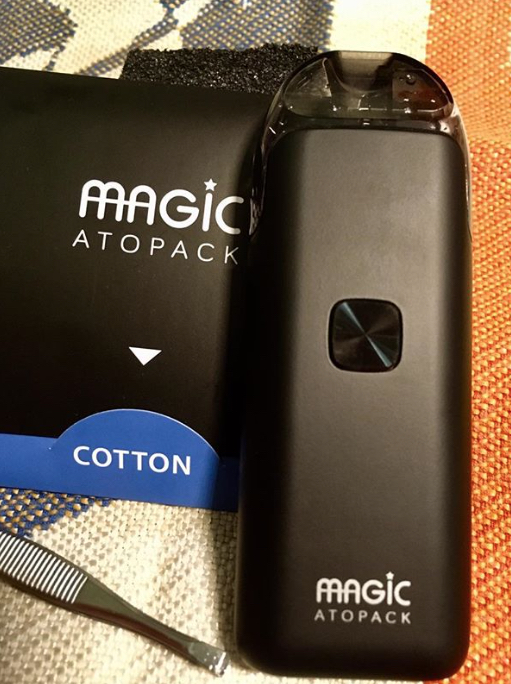 It’s all as simple as that, if you are after a tough yet slim pod system that will work all day and does not eat up expensive coils or cartridges this is the one for you, I strongly recommend it. 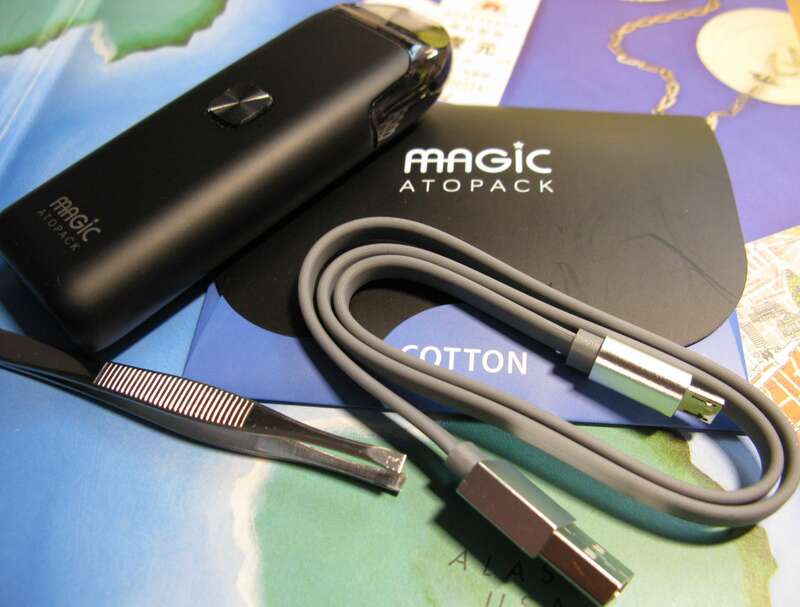 In the UK Magic Atopack is listed as available soon by the official distributor, with a free liquid for £26.99 + delivery. A bargain in my opinion considering the high build quality and supplied accessories.